Native culture is alive and well in Taos, and inhabitants and visitors alike celebrate that unique and rich tradition everyday through a plethora of arts, culture and music events. There are eight northern pueblos that are open-to-the-public, where visitors can learn how Taos’ native communities’ pottery, jewelry, dancing and food influenced the art and culture of the Southwest. 1. Taos Pueblo: Taos Pueblo (“The Place of the Red Willows”) is the only living Native American community designated both a World Heritage Site by UNESCO and a National Historic Landmark. The multi-story adobe buildings have been continuously inhabited for more than 1,000 years. Archaeologists say ancestors of the Taos Indians lived in this valley long before Columbus discovered America and hundreds of years before Europe emerged from the Dark Ages. Ancient ruins in the Taos Valley indicate those native to the region lived there nearly 1,000 years ago. The main part of the present buildings were most likely constructed between 1000 and 1450 A.D., and appeared much as they do today when the first Spanish explorers arrived in Northern New Mexico in 1540. 2. Picuris Pueblo: Named Pikuria (“Those Who Paint”) by Spanish colonizer Juan de Oñate, Picuris is located about 20 miles southeast of Taos in the Sangre de Cristo Mountains. Although it was once the largest, today Picuris is one of the smallest Tiwa pueblos, with less than 2,000 inhabitants. Like Taos, it was influenced by Plains Indian culture, particularly the Apaches. Picuris Pueblo is open 8 a.m. to 5 p.m. Monday-Friday. 3. More to Visit: There are eight pueblos you can visit today in northern New Mexico, each with its own unique traditions and culture. In addition to Taos Pueblo and Picuris Pueblo, Nambé Pueblo (“Mound of Earth in the Corner”), Ohkay Owingeh (“Village of the Strong People”), Pojoaque Pueblo (“Water Drinking Place”), San Ildefonso Pueblo (“Where the Water Cuts Through”), Santa Clara Pueblo (“Valley of the Wild Roses”) and Tesuque Pueblo (“Cottonwood Tree Place”) each provide a unique footprint of Native American culture. 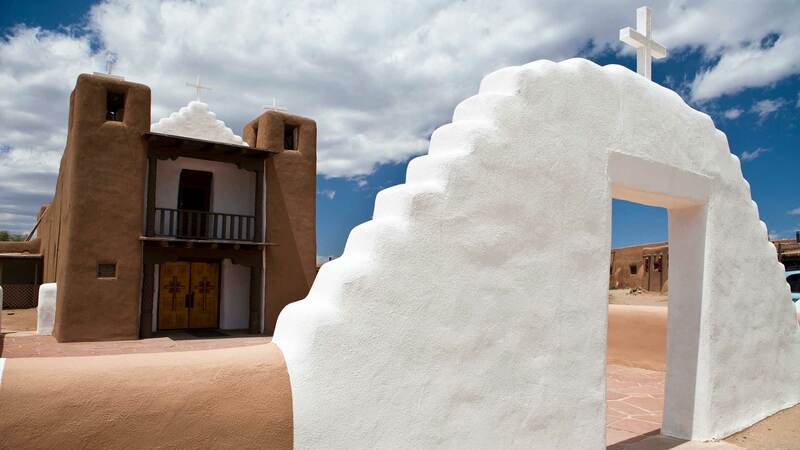 Learn more about the rich history of the region during your next trip to Taos. And remember: Before you visit, research the rules of each pueblo, such as photography and areas of the pueblo that are accessible to the public. Individual websites for each pueblo will give you the 411 on these Southwestern treasures.